My dad lives in the very way north of Minnesota, only a few miles from the Canadian Border crossing at Warroad. 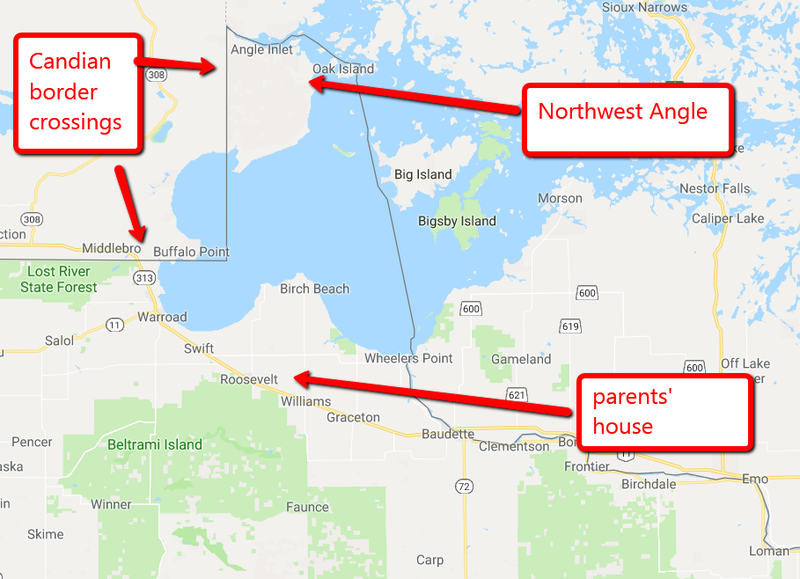 A short drive from there (as long as you have your passport), is the very northernmost part of the lower 48 states, the Angle Inlet aka the Northwest Angle. There was a cartographer's mistake like a million years ago when they were drawing the shape of the USA and so this tiny section, obviously originally intended to be "in Canada" instead was assigned "to Minnesota" and I'm glad too because it makes Minnesota look really cute at the top. But to get there you pretty much have to drive into Canada and then back into Minnesota - because ain't nobody got time to drive all the way there in a boat. Anyway, I had never been there. And on a 2017 trip to my parents' place, I fully planned to visit, (uninteresting detail to follow) but forgot my passport. So I made Zach FedEx it to me. Crossing the border at Warroad is slightly confusing - there is a great big beautiful brand new giant building on the left hand side of the road and a big arrow and so I got confused and went in there, but sort of figured out as I was walking in the door that I was at the USA customs, and not the Canada customs and so in typical Kady style, I "HAHAHAHAHAHAAA THIS IS US CUSTOMS RIGHT? NOT CANADA? HAHAHAHAHAHAH OOPS can I use your bathroom?" Then you drive up like you're going to Winnipeg, but take a hard right at a gas station that sells strange religious fiction novels and potato chips in flavors we don't have in the United States, for CANADIAN DOLLARS. And that's basically it - that's the "border". Just a blue sign saying: "WELCOME TO THE UNITED STATES, YOU ARE ENTERING ANGLE INLET, MINNESOTA." From there it's an honor system thing. You're required by law to go to the "customs building", which is basically just a videophone where you can either press "PUSH TO CALL [American flag]" or "PUSH TO CALL [Canadian flag]". I drove around for a while and then found a little bar and had some Molson Canadian (obviously), chatted up the Native kid bartender, learned all about how he and his siblings attended Minnesota's only remaining one room schoolhouse, and about how, when the teacher mentioned in the article I just linked to retired for a time (or moved away I can't remember), they all had to ride a bus every day back and forth 75 miles to Warroad.